There is a new ballpark from which balls are flying out at a record pace. Home runs are jumping off the bats of both the home team and its opponents, much more so than in the team's road games, begging the question of whether this new park is going to play like Coors Field. Or at least, like Coors Field used to play. I'm talking, of course, about Chase Field in Arizona. Granted, it's not that new. But the Diamondbacks and their opponents have hit 23 homers in their nine home games, but only one homer in their three road games, to date. This gives Chase Field a Home Run Park Factor of 7.667 right now, meaning that it is more than six and a half times easier to hit a home run in Phoenix than it is in a neutral MLB park. That number is asinine, and is obviously a result of the fact that the Diamondbacks have played only a handful of games. Chase Field has always been a hitter's park, as we know, but nothing has appreciably changed about it from the last several years. Since 2001, the home run park factor in Arizona has averaged about 1.07, meaning that it's about seven percent easier to homer there than at a neutral park. Seven percent, not seven hundred percent, mind you. This year, the D-Backs have hosted the Rockies, the Dodgers and the Cardinals, three teams that can hit pretty well. The Dodgers were a little below average last year in run scoring, but they've largely revamped their lineup. At bats that last year were mostly handled by an aging Jeff Kent and the three punchless musketeers of Angel Berroa, Blake Dewitt and Juan Pierre are now largely taken by Orlando Hudson, Rafael Furcal, Casey Blake and Manny Ramirez. The Rockies and Cards were both in the top half of the NL in run scoring last year, and in similar, though somewhat muted fashion, some of their offseason moves represent "addition by subtraction" as well. Willy Taveras, Cesar Izturis, and Adam Kennedy, are gone, and their replacements have helped to shore up the offenses of each team. Admittedly, there are some holes in this theory, as some of their hitters haven't really hit their stride and others are overperforming at the moment, but generally I think this makes sense. Nevertheless, we can see why the Diamondbacks' pitchers have had a hard time at home. And similarly, we can see why the Arizonas have themselves hit so many homers at Chase Field, facing the likes of Aaron Cook, Glendon Rusch, Joel Piniero and some inexperienced relievers. their three road games, against a rebuilding Giants team in the pitcher-friendly AT&T Park, have helped to skew the sample. No doubt, as the season plays out and the D-backs both face and provide better pitching, the homers will slow their torrid pace and we'll return to our regularly scheduled season of only moderately crazy home run rates, instead of the ridiculous ones we have now. In a related story: The New Yankee Stadium. There are probably a few sillier notions going around than the one that says the Yankees' new digs are a homer haven, but offhand, I can't think of any right now. After this weekend's opening series against the Cleveland Indians, as you've no doubt heard by now, the New Yankee Stadium is being hailed as "Coors Field East". The Yankees have hit nine homers in their four home games, to go with the 11 hit by the tribe. That's 20 bombs in just four games, and if you want to be thorough about it, you can add in the seven homers hit in the two exhibition games against the Cubs earlier this month. At the pace suggested by these first four regular season games, you'd expect 405(!) homers to be hit over the course of the year, a ridiculous number. For comparison's sake, the most homers ever hit in a ballpark in one season is (I believe) 303, set by the Colorado Rockies in 1999, who hit 144 homers in their 81 home games, but also allowed 159. 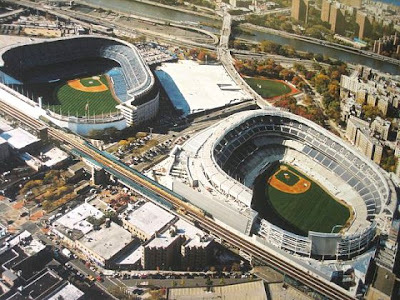 At this rate, then, the Yankees' sea-level ballpark, with dimensions almost exactly the same as their previous home, located literally right across the street from this one and facing in generally the same direction, would have to allow about 1/3 more homers than the homer-happiest ballpark in history at the peak of the steroid era. Which, as I said, is ridiculous. There have been suggestions that while the official dimensions are the same, the walls themselves are a little bit closer in some areas, especially the right field short porch, though these differences make up less than 10 feet in any one location, and usually more like four or five feet. Similarly, the outfield walls are shorter in a few places, though not very much shorter, and anyway, if you watched Chien-Ming Wang and rookie Anthony Clagett (ahem...) pitch on Saturday, you'd know that few of these homers are just barely clearing the fences. Most are no-doubters, and so we're left to wonder what other forces are at play here. The elevation and direction are the same. The dimensions are the same, mostly. One suggestion deals with the new, big scoreboards in centerfield, perhaps blocking the wind that used to keep some fly balls in the park, but this too is an insufficient explanation. The old park had a big scoreboard and billboards all the way across the outfield, more than 100 feet high probably, and so while the big, new video board might be bigger than the old one was, it should not make this much of a difference. The problem in both cases (that is, Chase Field and new Yankee Stadium) is that so little of the season has been played. The Yankees have played just 5% of their 2009 home schedule. Drawing any conclusions from these four games, with no apparent reason for the high incidence of homers to be blamed on the ballpark, is foolishness at best, yellow journalism at worst. Isn't it just possible that, say, the baseballs themselves are juicier or that the Yankees' pitching staff still has some kinks to work out? or that, you know, it's a statistical fluke? It would be like assuming that all of the 2,900 miles of Interstate 80 are straight and flat and largely devoid of traffic after having driven only the portion that goes through the Bonneville Salt Flats in Utah. I think I'll drive a bit further before making my decision, thanks. 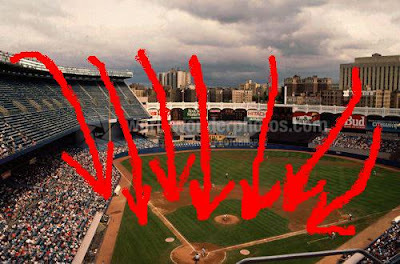 UPDATE: In light of the fact that Accu-Weather has weighed in on this issue, and thinks it may be new wind patterns due to the slightly different profiles of the former and current stadia's grandstands, I decided to posit my own theory on how the wind and weather may be affecting the baseballs hit at the new Yankee Stadium. Hey, my approach is about as scientific as theirs is.